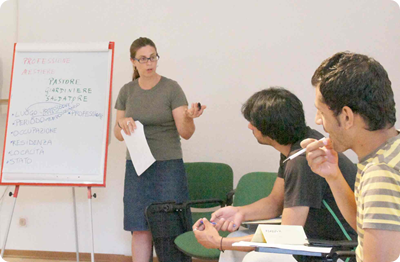 The University of Perugia has 11 academic faculties and a wide number of degree programmes. As the coordinating institution of BRIDGE-IT, the Department of Humanities and Education takes the role of supervising the project in all its scientific and administrative aspects, sets up a Virtual Learning and Communication Environment, and, together with the other partners, develops the BRIDGE-IT training methodology editing guidelines for creating and delivering online training paths. The Business Club AUSTRIALIA is a NPO-NGO, founded in 2000. 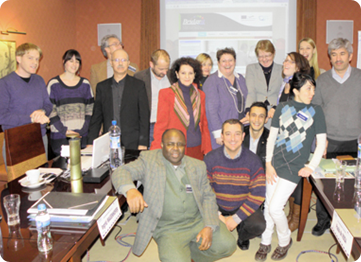 It provides In-Service Training for European teachers and trainers. Projects so far focussed on intercultural competences & communication, where the organisation by now has developed quite strong competences. The participation in “BRIDGE-IT” is a logical step towards a high-quality portfolio in intercultural education for adults. Erasmushogeschool Brussel is located in Brussels, capital of multilingual and multicultural Europe, where the need is high for training materials in the field of intercultural communication. The Centrum voor Vaktaal en Communicatie is a research group of the Department of Applied Linguistics of the Erasmushogeschool Brussel. The research focus is on special language communication and terminology and on multilingual knowledge management. The f-bb, Research Institute for Vocational Education and Training, works on behalf of companies, associations, ministries, the European Commission and other organisations on research and data collection projects and provides academic support for projects and programmes. The institute has developed 14 e-modules for the EU, Directorate General of Justice. These training modules concern intercultural competence and treat with the question how to deal with people from a migration background from different countries. Key & Key Communications, founded in 1994, is a cultural and scientific non-profit association with members from various cultural origins, working in the vast field of Communication. Its active role and contribution concerns the visual development of the whole project as well as the development of the BRIDGE-IT methodology as an online learning system through collection and editing of video-recordings, online learning templates for non-verbal & visual understanding of written/spoken texts, also acting as trainers according to specific competences. Established as a University in 1769, the University of Malta is the highest teaching institution in Malta. It is publicly funded and is open to all those who have the requisite qualifications. The University today has twelve faculties and more than 10,000 students. The BRIDGE-IT partnership is represented in Malta through members of the Faculty of Education who are also involved in the coordination of the Programme in Teaching for Diversity and the National Let Me Learn Teacher Training Programme. Zuyd University is one of the largest universities of applied sciences in the Netherlands and contributes to the BRIDGE-IT together with important network partners such as (EMOL) Centre of Expertise Social Support Limburg, (KCEM) Kenniscentrum Emancipatie Maastricht, Stichting Vrouw & Welzijn Geleen, (P-Team) Platform Successful Migrant Women Maastricht and (FORUM) Institute for multicultural affairs. EST Lifelong Learning Centre is a Polish continuing education provider for youth and adults founded in 1994. EST works in the fields of foreign language courses, ICT workshops, communication skills courses, integration of disadvantaged groups into the labour market. EST contributes to the BRIDGE-IT project with a substantial experience in evaluating projects co-funded by Community programmes and in training interpersonal communication skills to administrative staff of educational institutions. Yozgat Il Milli Egitim Müdürlügü (Yozgat National Education Directorate) is the top province administrative unit of Ministry of National Education, which provides service in Yozgat.